The University of Plymouth has teamed up with Arc Marine, the National Marine Aquarium and Plymouth City Council to make space for nature on the shore and beneath the waves as part of the regeneration project at Teats Hill. The foreshore at Teats Hill and the wider Plymouth area has both natural habitats (rocky shores, sandy beaches, mudflats) and artificial structures (seawalls, rock armouring, slipways, pontoons). These structures are typically constructed of either concrete or other smooth materials that offer poor habitat to marine life. There are five BIOBLOCKS on the foreshore at Teats Hill. Two of them are at the bottom of the old disused slipway and three of them are along the side of the University of Plymouth Marine Station slipway. pits on the other two vertical sides. BIOBLOCKs would normally replace a boulder in rock armour in front of a seawall, but the BIOBLOCKs at Teats Hill are on display so that everyone can see them and enjoy them. 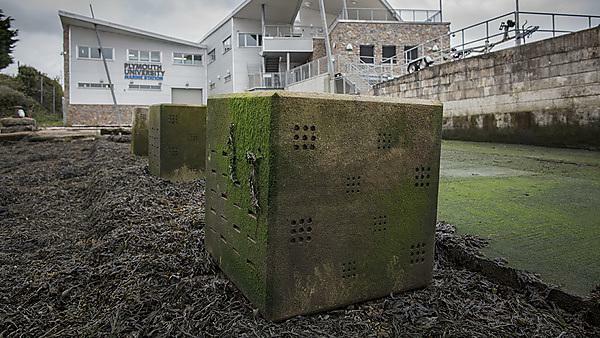 The original prototype BIOBLOCK is located in Colwyn Bay, North Wales and was designed by Louise Firth and Richard Thompson (University of Plymouth) and Steve Hawkins (Marine Biological Association of the UK) as part of the Theseus and Urbane projects. If you want to find out more information about the original BIOBLOCK, you can read more in Firth et al. (2014) Coastal Engineering and Sphere (summer 2017). If you are a school pupil or teacher, you can read more about eco-engineering on the foreshore in Firth et al. (2016) Science Journal for Teens. Beneath the water, Plymouth Sound has many important natural habitats: seagrass beds, kelp forests, rocky reefs and sandy/muddy areas. These habitats are threatened by human activity and require protection and management. The goal of the World Harbour Project is to develop resilient urban ports and harbours through a global network of collaborating scientists. The University of Plymouth is the only UK partner in this consortium which comprises 25 harbours globally. PhD student Katie O’Shaughnessy is supervised by Louise Firth, Richard Thompson, Mick Hanley, Paul Lunt (University of Plymouth) and Steve Hawkins (Marine Biological Association of the UK). She has led the Plymouth component of a global eco-engineering experiment that tested the effect of both physical and biotic complexity on colonising marine life. Katie’s research won the P1 foundation award in 2017. Dr Louise Firth was invited to collaborate with the National University of Singapore on the Singapore Seawall Project (2017-2020). 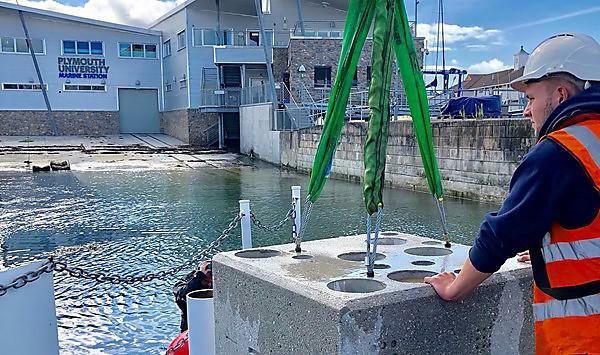 Peter Todd and Lynette Loke are leading an eco-engineering experiment that is investigating the role of reduced pH concrete on the diversity of colonising marine life on experimental tiles that have been deployed at two locations in both Plymouth and Singapore. Penang Island, Malaysia is one of the most densely populated places on earth. In response to rising human populations, a number of large artificial islands are being constructed to provide residential, commercial and leisure infrastructure. Dr Louise Firth has been working with Dr Su Yin Chee from Universiti Sains Malaysia to devise eco-engineering solutions to compensate for the impacts on the marine environment. The research team have characterised the present status and historical changes to the coastline of Penang (Chee et al. 2017). They have also been trialling a range of eco-engineering options in Penang, to test the efficacy of these solutions in a tropical context – to date they have only been tested in temperate conditions (Evans et al. 2016; Morris et al. 2017, and Morris et al. 2018). Theseus (2009-2014): Innovative technologies for safer European coasts in a changing climate. Urbane (2009-2014): Urban Research on Biodiversity on Artificial and Natural coastal Environment: enhancing biodiversity by intelligent design.